These eight frames show Saturn's northern pole as it appeared between the years of 2013 and 2017, as seen by Composite Infrared Spectrometer (CIRS) on the international Cassini mission. From left to right, the panels date to 17 August 2013, 18 October 2014, 9 June 2016, 20 September 2016 (top row) and 8 November 2016, 12 February 2017, 17 April 2017, 26 August 2017 (bottom row). They map the changing temperatures in Saturn's stratosphere, a layer of atmosphere a few hundred kilometres above the planet's cloud-tops, and displays these in colours ranging from cooler blues to hotter reds. Blue hues correspond to temperatures of -138 degrees Celsius (135 degrees Kelvin), and red hues to -123 degrees Celsius (150 degrees Kelvin). The darkest blues show areas of missing data and defects; notably, a warm polar cyclone was partially obscured in the panel obtained in August 2017. The data were gathered by the CIRS instrument during Cassini's solstice mission, the spacecraft's second extension, which began in September 2010 and ended in May 2017. In order to properly view the planet's north pole in full, Cassini observed from a high orbital inclination. 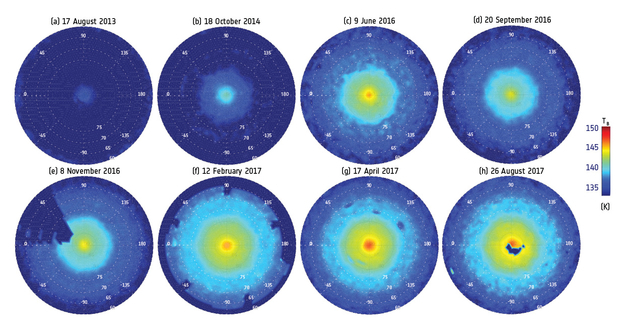 The hexagonal shape and boundary of the stratospheric vortex can be seen in all panels, growing increasingly clearer and warmer as time goes on.